Piercing the Future by Terry James is filled with the prophetic insight of some of the most well known Bible prophecy teachers of this closing era of the Church age. Most authors are names you will instantly recognize. What does the new millennium hold for Planet Earth? Your future has been foretold thousands of years in advance. There is, however, only one source to be relied on as 100 percent accurate in foretelling things to come. 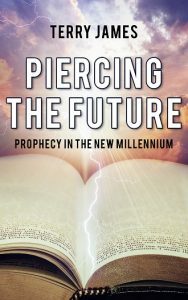 Piercing the Future, Prophecy, and the New Millennium examines that source and its many predictions while we move into and through this most exciting time in human history. Will there be war or peace? Will there be prosperity or depression? Can you know your future and the futures of those you love? Leading authorities in the field carefully examine prophecies past, present, and future, and how those matters will most likely impact your life. They help you pierce the future to gain a thought-provoking comprehension about what lies ahead for you and those you love in this dawning millennium and beyond. You can get this tremendous overview of Planet Earth’s immediate future in paper back or in Kindel.